Should we get Bunk Beds? When I was a child my sister and I had bunk beds. I was on the top and she was on the bottom. We didn’t have a very big house and by sharing a bedroom we got to have a playroom which we loved. I had a couple of problems sharing a bunk bed. 1. My sister would kick me through the wire base and I’d shoot up in the air and she found this really funny. Sometimes if she couldn’t sleep she would just do this to make herself laugh (and wake me up.) I understandably never found this very funny. I felt safe up on the top bunk. My dad would sit and read to us and because I was on the top bunk I could lean down and see the pictures even when the book faced him. We are better off than my mum and dad were and our kids are (in my opinion) extremely lucky to have a bedroom each. HOWEVER they would absolutely love to have bunk beds. To spend hours whispering and giggling together, playing games, sharing stories and secrets. 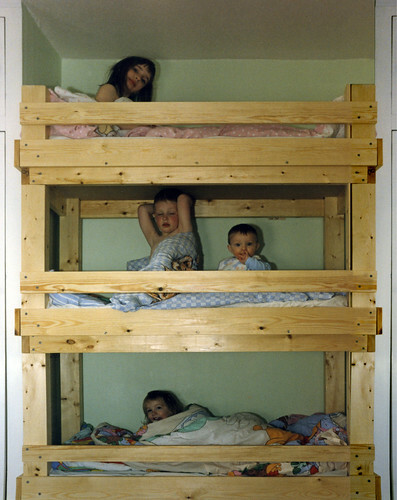 When we go on holiday as a family sharing a room, bunk beds specifically, is often one of their highlights. I have a boy of 7 and a girl of 4. There are, I think, only a few years left that he will want to share with her before he gets spotty, hormonal and private. Should I let them build some fab memories or will neither of them (or me) ever get a good night’s sleep again? Next Post Sunday Inspiration: Some say love…. I would go for it! Its great for sleepovers and my kids love theres although my oldest is 13 now and getting a bit big really. Also you can hang sheets/ blankets round the bottom bunk and it makes a great den! They were fun while they lasted! After reading your post i directory through myself in flashback,where i was having fun with my siblings on bunk beds.When i was a kid i used to sleep in bunk beds with my little sister and brother.We had a great fun sleeping on bunk beds. You paint a lovely picture of sibling love here Becky, but when I’ve put my two together in bunk beds, the arguing gets the better of me! Maybe I should perseve though to give them these kind of memories! Becky, i’d say go for bunk beds. You are right you still have a few years left before they both need their privacy. So allow them to savor their childhood now. Letting them have a bunk bed will definitely allow them to bond more. Im sure they will love it as much as you did. IOP is never elevated when one is happy and tranquil. eyes the wrong way and instantly you.